An ongoing discussion of one weaver's life…..
It’s been a LONG time since I wrote anything here. Lots of water under the bridge. Major life changes. Consolidation of studio and house with masses of attendant divestment of Stuff, which turned out to be an enormous relief. And though the settling in isn’t yet complete, I’m finally back at my Real Work. My remaining loom (sold the big one, which now resides in Texas) is the main feature of the living space of my small house. This is the first warp to be woven in the new location, threaded and ready to wind on come Thursday. 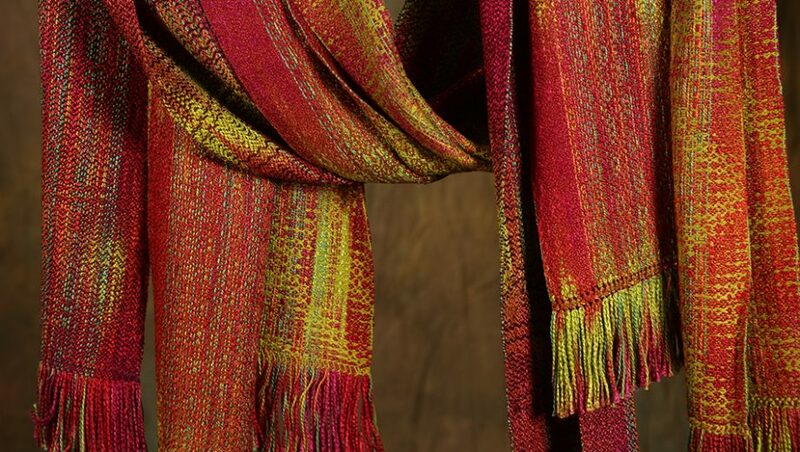 Two yarns — the hand-dyed multi-color is silk and rayon; the solid is a lustrous Egyptian cotton which is randomly distributed amongst the silk/rayon. 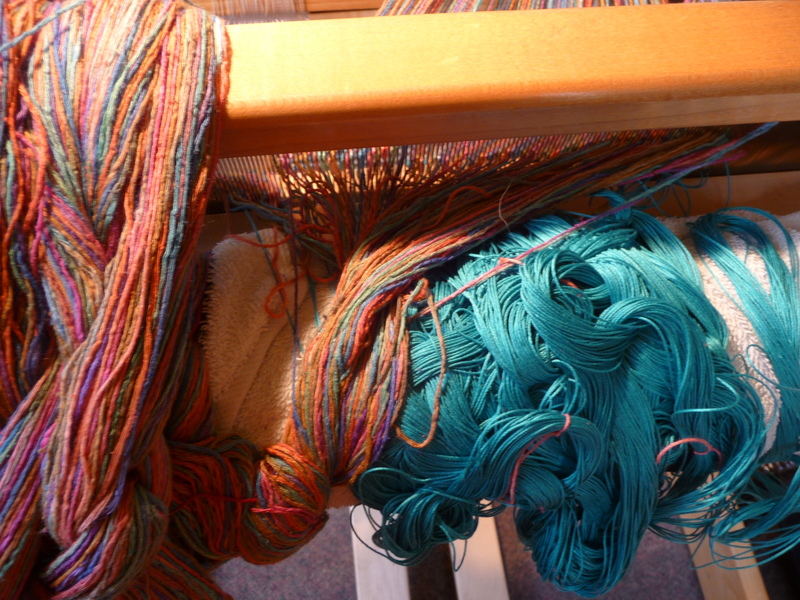 Looks like a hodge-podge now, but will all be smooth and under tension, ready to weave, by the end of the week. 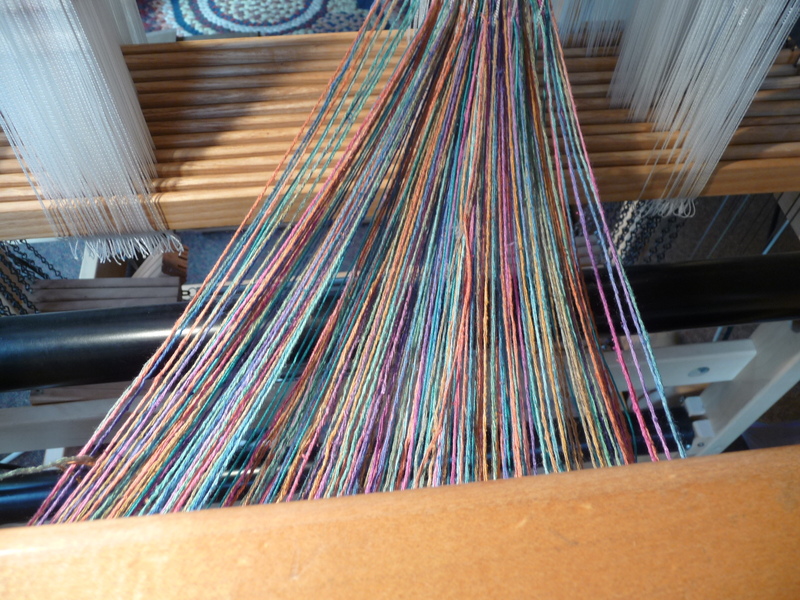 There will be five scarves, each woven with a different weft yarn (all tencel or bamboo) and a different pattern. I’ll be posting progress reports as I go along, with pretty pictures. If one of them appeals to you, and you want it for your very own, let me know. No name yet for this series; I’ll surely have ideas once the warp is in good order and I see how the colors blend. You chose lovely colours. My kind of taste. Enjoy the weaving when you start. Thanks, Micki. I didn’t get the warp wound on today, but expect to tomorrow (Friday). Have to do it while the cats are napping so I don’t have to be concerned about kittens playing with all those threads!